Land Rover is recalling more than 65,000 cars to fix a software bug that can "unlatch" the vehicles' doors. Drivers would get no dashboard warning that the doors of their car had been unlocked, the firm said. 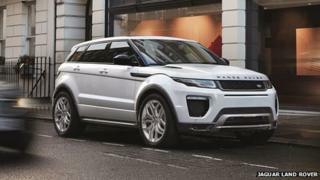 The glitch affects Range Rover and Range Rover Sport vehicles sold between 2013 and now. In a statement, Land Rover said no accidents or injuries were reported to have occurred as a result of the bug. Range Rover owners would not have to pay for the modifications to be made, it added. Adverts have been placed in newspapers informing owners about the recall and the "unlatching" issue. Land Rover said the recall was not related to widely-reported problems with keyless ignition and locking systems on some luxury cars that had made them favourites with car thieves. Last year car thieves were found to be targeting some models of Range Rovers and BMW X5s because they found it easy to unlock the vehicles. It is believed that a handheld "black box" was being used by some gangs to unlock and start cars that had keyless ignition systems. Some newspapers reported that insurers were unwilling to extend cover to Range Rover owners unless they could park in secure, off-street car parks. Other insurance firms insisted on the use of tracking systems that could help find a car if it was stolen. "It's been known for over a year that keyless entry and ignition systems possess certain vulnerabilities," said a spokesman for Thatcham Research which gathers data on car crime. "There were a number of vehicles suggested as being vulnerable in this way, Range Rovers being one of them," he said. Other cars targeted include Ford Focus and Fiestas, Audis and some light commercial vehicles. "That was all to do with keyless entry systems and vulnerabilities through the onboard diagnostic port," he said. A thief who got access to a car could plug a device into that port that helped to re-program a blank key so it could be used to start the car, he said. Cars were being stolen to order or were being broken up for cheap spares. "All the manufacturers have been working hard to find a solution to this and are well on the way to introducing preventative measures," he said.